By WALTER J. TAPPER, A.R.I.B.A. The Church will be erected on a well chosen site in the York Road, at a point where it forms a junction with Southchurch Avenue. It is high ground, and the subsoil, being excellent gravel, will form a good foundation for the Fabric. The building, being one of high proportions, will, when completed with the Tower, form a conspicuous land mark from the Sea. The site is in form a parallelogram and measures 235 ft. 0 in. from East to West by 100 ft. 0 in. North to South. The Church is to be placed towards the western boundary, leaving a sufficient area for future Parish room and Vicarage at its eastern end. These latter are arranged to form a quadrangle. Click here to view the full site plans. 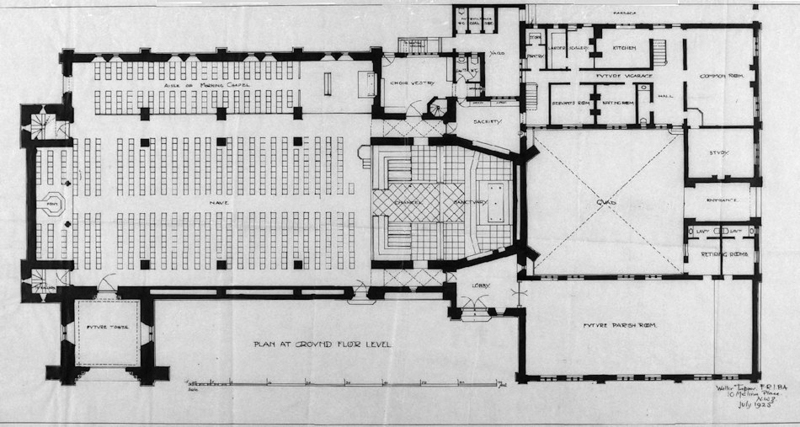 The Church itself will consist of a Nave of four bays, with a North Aisle, at the eastern end of which is a morning chapel, convenient for small congregations, a Chancel of two bays, the easternmost of which has canted sides. Vestries are places on the North side of the Chancel, with Heating Chamber below. The Tower is at the South West corner of the Nave. The completed Church will accommodate 800 people. The Nave and Chancel are the same width and height, namely, 30 feet wide and 60 feet high to the apex of the Vault, the length internally being 126 feet, divided into seven compartments by eight transverse arches, buttressed internally, with piers, pierced at the floor level, forming Archways to the passages round the Church. A recessed arcade having a barrel vault longitudinally is thus obtained. The North and South external walls of the Nave are of sufficient thickness to admit of a passage way at a height of 23 feet from the main floor level, and here is introduced an arcade, behind which will be seen the tall lancet headed windows. Perspective and a quality of light and shade will be so obtained. At the West end a gallery is introduced, underneath which comes the Baptistery. A Wrought Iron Screen marks the entrance to the Chancel. 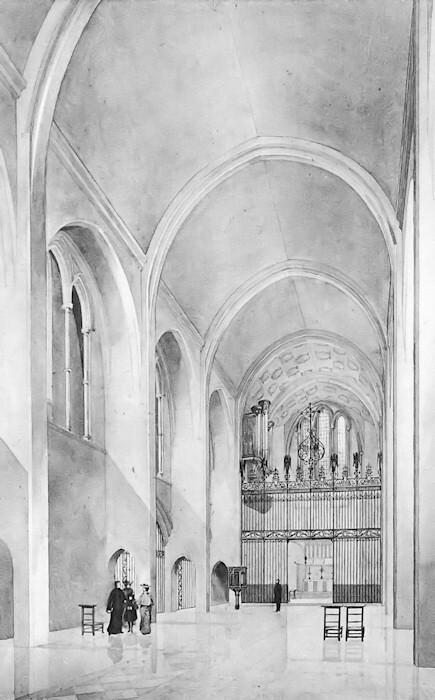 Click here to see Tapper's illustration of the Nave and Chancel. The Organ, with it's case, will be placed on the north side of the Choir, bracketed out at the level of the quasi-triforium. At the East end, high up, behind an open arcade, is introduced a triple lancet headed window, and this, filled with painted glass, (simple figures on Gresaille work), will, with the large triptych behind the altar, give the necessary warmth and brightness to this important portion of the building.